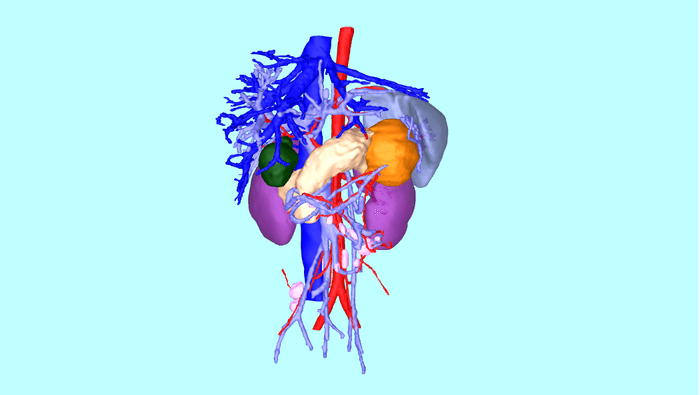 For an emergency operation at Beijing Children’s Hospital, a surgical rehearsal model made by OrganLike was used by surgeons to practice for the challenging surgery to remove a tumour between the girl’s spleen and pancreas. The unfortunate patient is a relative of OrganLike founder Isaac Wang. He received a phone call explaining the situation in late June. Within 48 hours the patient’s scans had been sent from China and precise imagery was made of the organs, arterial network and tumour. In less than a week, Isaac was en-route to Beijing with several OrganLike hyper-real organic models. The operation was especially challenging as the tumour lay between the pancreas and spleen with the artery and vein of the spleen lying on top of the tumour. This made it difficult to remove the tumour without damaging the spleen. The OrganLike models attracted much attention at the hospital and captured the interest of Prof Hong Qin, described to us as China’s leading child cancer surgeon. Prof Qin said that the model was surprisingly life-like, particularly the realistic way it felt, and would be very helpful especially for very difficult surgery. A rehearsal took place using the OrganLike model on 11th July. Prof Qin carried out the surgery on the morning of the 12th July and it was very successful. This is the first real use of an OrganLike model for surgical rehearsal and 24months ahead of our planned development schedule. There has been significant subsequent excitement to use our models for further complex operations in China.